That’s the same sort of question genetic genealogists have been asking about the so-called admixture reports in our DNA test results. Those are the estimates by the various DNA testing laboratories and companies of what percentage of your ancestry can be traced to specific parts of the world. The simple fact is, it’s not soup yet. 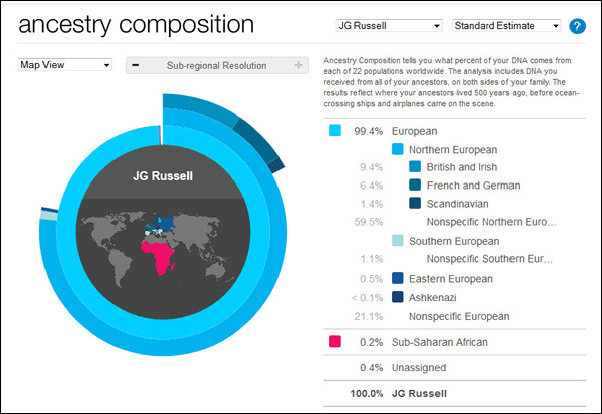 But it’s getting closer every day, and things took a big step forward this week when the testing company 23andMe presented its new Ancestry Composition feature, with lots of options for looking at your admixture results. 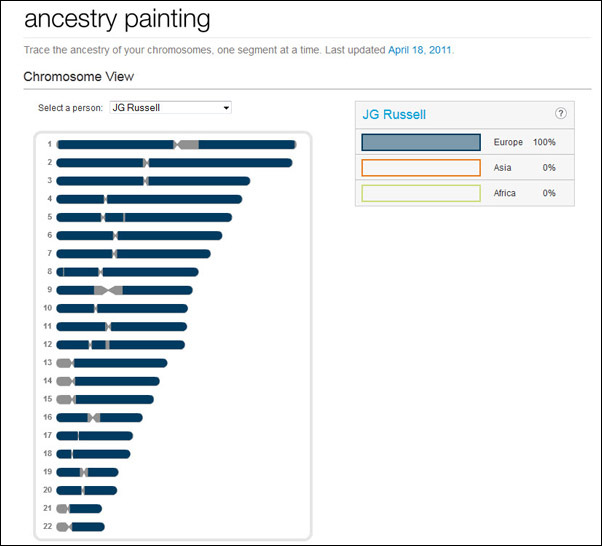 Before this new system, my 23andMe admixture results were… well… frankly disappointing. I mean, really. 100% European. How boring can you get! And when I first looked at the new system, I was still… well… frankly disappointed. Oh, joy. I’ve “improved” all the way from 100% European to (gasp) 99.4% European, picking up 0.2% sub-Saharan African and 0.4% who-the-hell-knows in the mix. And then I started playing with all the options. The first thing you can tell the system to do is break your admixture down to the smallest segments it can. And that gives me a little more information. Now that’s a little better. I’m still 80.6% somewhere-in-Europe but I’ve picked up 9.4% British and Irish, 6.4% French and German, 1.4% Scandinavia, 0.5% Eastern European and less than 0.1% Askenazi Jewish to go along with my 0.2% sub-Saharan African and 0.4% who-the-hell-knows. Better still. Now I’m 36.4% somewhere-in-northern-Europe, 1.2% somewhere-in-southern-Europe, and 2.7% somewhere-generally-in-Europe, 25.8% British and Irish, 26.0% French and German, 5.8% Scandinavia, 1.1% Italian, 0.6% Eastern European, less than 0.1% Askenazi Jewish, and 0.2% sub-Saharan African and only 0.1% who-the-hell-knows. Generally speaking, the results look pretty good overall. Folks who know a great deal more about this than I do say this is a major move in the right direction, and it certainly appears to reflect major chunks of my known heritage. So why isn’t it soup? Because there’s a lot we still don’t know, and some things even this admixture system reports than just don’t make sense. Take, for example, my X chromosome results. 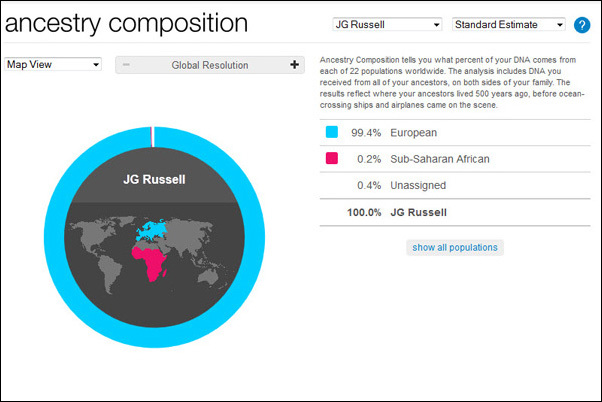 The new Ancestry Composition says my X DNA is entirely European but identifies none of my X DNA as French-German. Now I got one entire X chromosome from my German-born father. He inherited it lock stock and barrel from his German-born mother. She got one of her X chromosomes from her German-born father (who got it lock stock and barrel from his German-born mother and so forth) and the other from her German-born mother who inherited from her German-born parents (and so forth). I have literally hundreds of documented years of nothing but Germans on my father’s side. 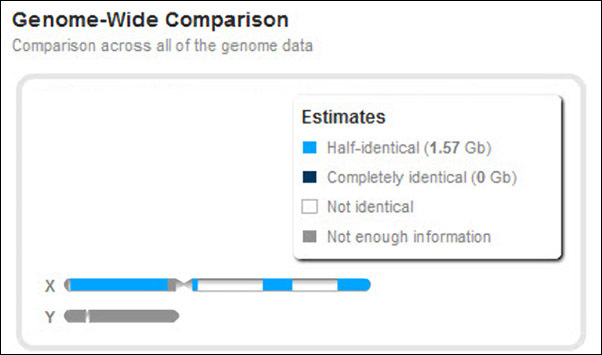 So why isn’t roughly one-half of my X DNA being detected as French-German? I don’t know. I’d write this off as just an anomaly of the algorithm — that maybe the software can’t read French-German in the X chromosome region — except that I have a nephew, my sister’s son, who has also tested with 23andMe. Being male, he has only one X chromosome, and he inherited that solely from his mother. Now it’s certainly possible that she and I got very different X DNA bits and pieces on the X chromosome we each got from our mother, since it would be a mix of the X DNA from our maternal grandparents. But one of the X chromosomes each of us received has got to be identical: our father only had one X chromosome to give to his daughters. My nephew’s one X chromosome would be a mix of the X DNA from both of his maternal grandparents, my sister’s and my parents. So he should have about 50% from our mother and 50% from our father. Since I have twice as much X chromosome real estate as he has, you’d figure about 25% of my total X DNA would match him. Moreover, since all of his X DNA came from his mother, anything he has that’s French-German is X DNA I have to have too. No question it’s hard to distinguish one European population from another, and there’s no doubt this whole admixture area is a work in progress. Things are bound to improve and, perhaps, when the data from the new Geno 2.0 test from National Geographic is added to the mix, we’ll get this nailed down someday. I may be wrong, but I don’t think the split between the two X-chromasomes from your mother guarantees a 50% mix that should match a sibling. One might receive almost exactly X-1 and another sibling could receive almost exactly X-2. Which would be why the Y-chromasome makes it so much easier to trace that direct male lineage. If I’m wrong – let me know – I’m about to buy two kits for my brother and I! I want to make sure I understand those results. Denise, just to make sure we’re on the same page: the DNA I’m talking about here isn’t the mother-to-daughter-to-daughter mitochondrial DNA (mtDNA) but the X DNA — the DNA in the gender-determinative X chromosomes. Men only have one X chromosome, from their mother. Women have two X chromosomes, one from their mother and the other from their father. Now you’re right that the X chromosome my sister and I each received from our mother could be very different. But any French-German X DNA my nephew has really can’t be coming from my mother’s side of the family. She’s essentially 100% colonial American-British-Scots-Irish. By contrast, remember that our father only had one X chromosome and he passed that on to both my sister and me in what is essentially the exact same form — and that’s where our real French-German ancestry comes from. So the portion of my nephew’s X DNA that shows up as French-German OUGHT to be from my father’s side, and that portion HAS to have come from the X chromosome my sister got from our father — and that’s identical to one of MY X chromosomes. And that raises the question of why it’s identifiable as French-German in him, but not in me. I like the option to let ‘er rip and let the algorithm behind! These DNA companies are constantly improving their results for the “big three” tests, I hear (from Mike Maglio at @OriginHunters), so I’m going to wait a few more months to get mine done. Thank you for all this information about the DNA work in progress. I’ll get educated now, so that when I DO get my DNA done, I’ll have a better chance of understanding the details! I am so glad you posted this, and I checked my report with 23andMe. I, also have the 100% boring European report. 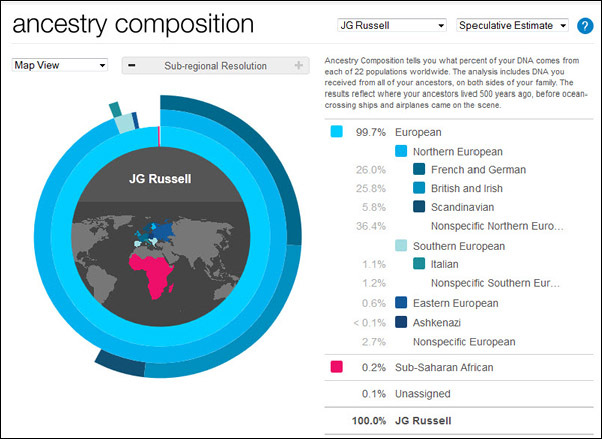 With the Ancestry composition, I now have 99.8% European. Thank you for posting your report, and I’m glad I took the time to read it! Nice to know I’m not the only one with… um… not-exactly-earth-shattering results, Barbara. I got the same sort of reaction when I got my AncestryDNA results. It said my genetic ethnicity results were 96% British Isles. Yeah? Tell me something that I don’t know. BORING! One of my matches gets something like 99.8% British! Two questions: which test did you take and how did it compare with the Ancestry test? It appears to have a more comprehensive breakdown than Ancestry. This particular test is the Relative Finder test from 23andMe, and it’s much more conservative than AncestryDNA particularly on things like Scandinavian admixture. AncestryDNA appears to be convinced that anyone with Scots-Irish ancestry or British-Irish ancestry has HUGE segments of Scandinavian, and I have my doubts about that. Well, I don’t. As I said earlier, my AncestryDNA test stated that my ethnicity results were 96% British Isles. What I didn’t say about it was that remaining 4% was unknown. I did NOT have any Scandinavian results. At least not that AncestryDNA could tell at this time.